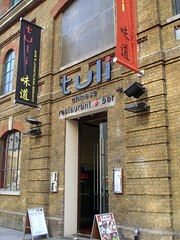 Tuli was a large Chinese restaurant on Tooley Street near London Bridge Station. It closed some time around December 2012 in connection with improvement works at the station, and as of June 2013 the premises remain boarded up photo. The building was later demolished, and is now the site of a new concourse for London Bridge station. Large Chinese restaurant on Tooley Street near London Bridge Station. The entrance is a former railway building, and the restaurant itself is housed in one of the railway arches. It opened in early 2010 as a pan-Asian buffet restaurant, but changed to an à la carte Cantonese menu later the same year. The new incarnation is quite smart, with white-clothed tables and an open, airy feel. As of June 2012 they serve dim sum both at lunchtime and in the evening. Kake and various others have visited several times now for a dim sum lunch, most recently in June 2012. We generally come on a Thursday or Friday, and arrive around 1pm; there have usually been several other parties in but plenty of spare tables, and peaceful music playing, a mix of Chinese and Western classical. From the cold dishes section of the menu, "purple cucumber with smoked jelly garlic" (香蒜拍黃瓜/xiāng suàn pái huáng guā; £3.80 in March 2011) photo was actually ordinary cucumber dressed with a little chilli oil and a plentiful quantity of garlic that had been fried to the point of browning. It was pretty tasty. From the appetiser section, pan-fried pork dumplings (生煎鍋貼/shēng jiān guō tiē; £4.80 in May 2011) were good, with nice chewy skins. Pork and preserved duck egg congee (皮蛋瘦肉粥/pí dàn shòu ròu zhǒu; £4.80 in March 2011) has been of variable quality on our visits. It was very good in March 2011, with plenty of shredded meat distributed evenly throughout and sliced deep-fried doughsticks on top for a textural contrast; less good in May 2011, being a little too watery, lacking in meat, and served with what seemed to be shreds of fried spring roll skin instead of doughsticks; but back to a good texture with plenty of meat (though no doughsticks) in June 2012. Roast pork puff pastries (蜜汁叉燒酥/mì zhī chā shāo sū; £2.60 in March 2011) were nicely filled and served warm. Pan-fried turnip paste (蘿蔔糕/luó bo gāo; £2.60 in March 2011) was fine, as were minced pork and shrimp dumplings (siu mai) (蟹王蒸燒賣/xiè wá zhēng shāo mài; £2.60 in March 2011). Har gow (steamed prawn dumplings; 水晶鮮蝦餃/shuǐ jīng xiān xiā jiǎo; £2.90 in May 2011) were overcooked in May 2011 to the point that the thick, stodgy wrappers were falling apart, but much better in June 2012. Steamed spare ribs with salted yolk (咸蛋黄蒸排骨; £2.90 in August 2011) photo were a nice variation on the types of spare rib you normally see at dim sum, and well executed. Minced pork and goji berry dumplings (杞子蝦燒賣; £3.30 in August 2011) photo were also interestingly unusual and tasty; siu mai skins filled with minced pork and mushrooms, topped with decent-sized prawns and a goji berry apiece. Chicken and sausage dumplings (腊味雞粒餃; £2.90 in August 2011) were a bit gristly, while crispy fish roll with black pepper (黑椒酥炸魚柳卷; £3.10 in August 2011) photo was very thickly battered and mostly tasted of fried. Shanghai-style pork dumplings (上海小籠包/Shànghǎi xiǎo lóng bāo; £2.60 in May 2011) were OK on our May 2011 visit (juicy, but without the quantity of soup that a true 小籠包 should contain) but much better on our August 2011 visit, with plenty of soup inside; in June 2012 they still had a noticeable amount of soup, though less than before. Tea options include chrysanthemum, pu-er, tieguanyin, and jasmine, the latter two of which were charged at £1.50/head in March 2011. They also have a separate tea menu, with more expensive options served in an attractive glass teapot photo. Our food came to just over £10/head on our March 2011 visit and £12/head in May 2011, including the 12.5% service charge that was automatically added to the bill. In June 2012 we paid just under £80 for four adults and two young children. Kake's verdict: Although not the best dim sum I've ever had in London, this is far from the worst, and I like that they're offering things that the more mediocre places can't be bothered with, such as congee, cheung fun, and turnip paste. Similarly, although the main menu may seem at first glance to consist mainly of "X in Y sauce" type dishes, there are some interesting bits and pieces in there that make me think it would be worth an evening trip too — though I'd suggest going with someone who knows enough about proper Chinese food to be able to pick out the good stuff. Child-friendliness: Like most good Chinese restaurants, they welcome children. Several highchairs are available. On our June 2012 visit, the staff were happy to interact with the children in our party, and had no problem with them wandering over to investigate the aquarium in the foyer several times during the meal. Accessibility: Step-free to get in, to the main dining area (there's a mezzanine up some steps which may have more tables, but there's plenty of space in the main area), and to the toilets. There's a separate accessible toilet, but in addition there's an extra-wide stall in the ladies' with grab bars and a door that opens outwards. The lighting in the restaurant is rather flickery from certain tables (though fine from others). Last visited by Kake et al., October 2012. Last edited 2018-02-23 13:25:40 (version 11; diff). List all versions. Page last edited 2018-02-23 13:25:40 (version 11).